Not only is smoking a terrible habit, it’s also the cause of thousands of residential fires annually. Damage caused by a fire can be extremely extensive, wreaking havoc to your property and belongings. Not to mention that your Homeowner’s Insurance may not be enough to cover fire damage restoration. Lastly, but most importantly, regardless of how extensive a fire was, thorough fire inspection is necessary to make sure there is no structural damage or odor residue. Sounds frightening? 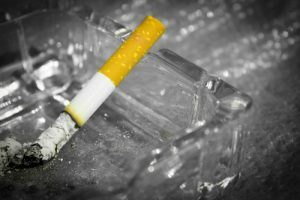 To prevent a smoking-related fire, you need to exercise caution. Here are some guidelines. It’s hard to imagine that anyone smokes indoors these days, yet it happens. If you or any members of your family are smokers, the best thing to do is smoke outdoors. If you are having friends over and know that there are smokers among them, kindly ask them not to smoke indoors. Cigarette buds can ignite curtains, upholstery, books, magazines and many other items in your home. Don’t risk fire damage to your property by ignoring this simple guideline. However silly it sounds, you shouldn’t smoke if you are feeling tired. The risk of falling asleep on the couch with the cigarette still burning is very real in these situations. The same applies if you have taken a medicine that is known to make you sleepy. Children are completely unaware of all the dangers a fire can cause. It comes as no surprise that they like playing with lighters and matches, so make sure to keep them out of reach. The wisest thing is to keep the cigarettes, lighters, matches or any other lighting devices locked away in a cabinet or on the top shelves. Apart from the living room, the bedroom is also a common place for a smoking-related fire to occur. The mattresses and bed sheets catch fire very easily, and the danger of them catching fire with you in bed is terrible enough, not to mention that you would be incapable of preventing it from spreading to the rest of the house. Whether you smoke indoors or outdoors, it’s imperative that you use only sturdy ash trays that are unlikely to fall over. What’s more, to make sure you always put the cigarette out completely, fill the ash tray with sand. Before emptying the ash tray in the trash, douse the cigarettes in water once again, as an extra precaution. If you are smoking in the backyard, you may be tempted to discard cigarette buds in the vegetation growing there. Chances are the leaves and mulch can get dry, and can catch fire easily in contact with a fresh cigarette bud. Remind your friends not to do that, as well. Instead, place enough ash trays for everyone to use. Fire-safe cigarettes are labeled FSC just above the barcode. They extinguish faster than the non-FSC cigarettes and are slightly safer to use. As most electronic cigarettes use lithium batteries, they also pose a potential safety threat. Never leave them unattended where your children can reach them. Unfortunately, fires are not uncommon in La Jolla. As a responsible home owner, you should follow the safety guidelines and also have a number of a reliable restoration contractor to assess and curb fire damage in your home. KIC Restoration has a 24/7 emergency line – we are here to provide top-notch and transparent restoration services. Call us at (858) 859-1998.